Just four years ago, my friend Marcus Sheridan discovered the power of content marketing and rescued his nearly bankrupt pool and spa business. He dove deep into blogging and propelled River Pools and Spas to a dominant leadership position in his home state of Virginia. Today, while still maintaining partial ownership of the pool business, Marcus, a.k.a. “The Sales Lion,” is a very in-demand online marketing consultant and speaker. While he credits much of his success to his ascent up the ranks in search, he’ll be the first to tell you getting found is merely the beginning. In a keynote he delivered at last year’s Content Marketing World, Marcus stressed the real objective is to leverage the power of content marketing to qualify prospects. He went so far as to draw a very black and white line for his websites: only the visitors that look at 30 pages are viable prospects. Those that invest the time to view the hefty pile of pages merit a sales consultation. Those that don’t, don’t. There’s nothing arbitrary about Marcus’s method. History (and, of course, careful number crunching) has proven serious leads get seriously into his website. If you want to be successful, you need to understand how to get your website visitors to click around and stick around. I’ve seen what sabotages websites. I offer a free consulting service called “webVision.” Sounds fancy. It’s not. Instead of relentlessly exchanging emails or doing a pre-crafted sales pitch, I get on the phone and screen with a new business prospect to examine the company’s website and online marketing properties aiming to explore ways to make them more effective. Screen-sharing freebies make this easy and, well, free. But it’s valuable. I’m not harping on webVision to get you to signup (though I offer a link if you’re interested). I want to share my takeaways with you, the common mistakes I see website owners making that discourage new business prospects from getting into the website or getting any closer to becoming a customer. Chasing away prospects is bad news. The good news: these fatal flaws are easily rectified. 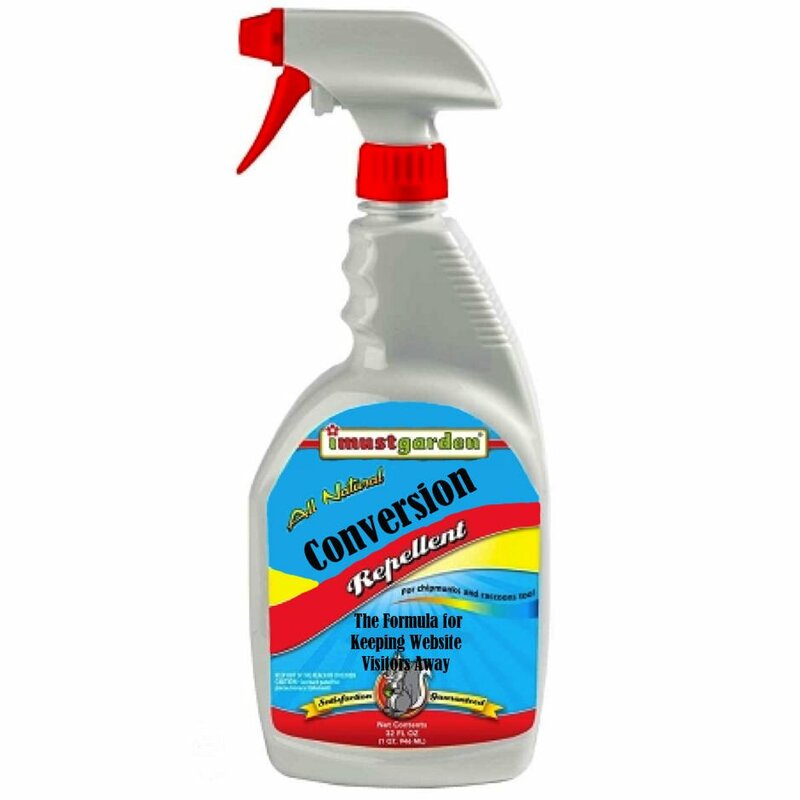 Here are eleven conversion killers I come across time and again. This is probably the web’s leading contributor to back-buttonitis. Sufferers of this disorder can’t even justly claim to have crappy conversion rates because they have no definition of conversion. Ouch. C’mon, really? I’m not saying this will never happen, but it’s naïve to believe it will happen often. Please, think like your gun-shy, skeptical, research-conducting visitor. Offer a reasonable baby step. One word of advice: decide. I’ll accept this answer if your stuff is inexpensive, easy to understand, easy to buy and risk-free. In fact, if your sale meets these qualifications it’s a good answer. If it doesn’t, it’s borderline nuts. This one is dangerously rampant. Your homepage, or worse yet, your campaign-specific landing page, is crowded, confusing, and poorly designed. No one wants to wade through a messy page. And they won’t. Make the page welcoming, simple, and clean. Go easy on the options. Keep the noise level down. In fact, silence is golden. Auto-play audio and video is a nasty tactic. This is your lobby. It has to be tidy, welcoming, and comfy. Your website traffic comes from other websites. Search engines and pay-per-click campaigns are likely to be your top draws. So keyword continuity is paramount. Conversely, keyword disconnect is lethal. This means that the term the visitor used to discover your content, or at the very least, the concept behind the term, must jump off the page into the reader’s brain. Don’t choke on this opportunity or forget this tip; deliver what the visitor came to find. Your landing page should reassure the reader he’s come to the right place and relevance is the key to conversion. So, if you’re running specific campaigns, via search, PPC, social media, guest blogging, or what have you, the headline the visitor discovers upon arrival should map to the phrase they just clicked. You don’t have to offer webVision to discover this problem. Every second, website surfers land on pages crammed with industry babble. You know what I mean—buzzwords like “infrastructure,” “software as a service,” or any hunk of jargon that describes what you sell. Put a lid on it. At the very least, save the buzzwords for the product pages and data sheets. Remember you’re not talking to yourself—or even a customer. You’re talking to a prospect. The prospect is a person. Be personable. Speak person-to-person. The opposite, “brand-to-user,” is pure engagement poison. As a marketer, you’re either going to establish trust or you’re not. The trust you earn traces to the credibility you conjure. One way or another, your website newbie needs to find signs that indicate you know your stuff. If you haven’t yet written a book, the “social proof” (or evidence) surfers seek can come from articles, videos, reports, case studies, testimonials, badges, certifications, press releases, and so on. Even links to social media will serve this cause. And besides talking the talk, you must walk the walk. Be honest, candid, and demonstrate integrity in every word uttered or written. Your website has to prove you’re a credible problem solver. Publishing a brochure won’t be enough. As the hub and home of your online marketing, your website should wear a friendly face that says, “Come on in and allow us to help you solve your business problems.” However, far too many companies confuse the idea with the more conventional voice: “You’ve come to the right place for the best [product type here]. Now click here and buy it.” This is pushy, which naturally, pushes people away. If you want visitors to get into your site and value your company, you’ll offer informative and helpful content. Executing the strategy requires offering a blog, where the prospect easily gathers good advice about the business issues he wrestles with daily. You’ll also want to further empower your prospects by packaging useful content in multiple forms such as eBooks, videos, podcasts and webinars, offered at no cost, with no risk. Learn why smart marketing is about help, not hype in the soon-to-be-published book, “Youtility,” by Jay Baer. On a one-way website, information flows from the your company to the visitor, period. There are no fields to fill in, no email or RSS feeds to capture contact information, no place to make comments or requests, to ask questions, contribute ideas, complain or even give compliments. Don’t make this mistake. Instead, make a website that encourages interaction. Take advantage of every opportunity to engage the audience, let them know you’re listening, interested in their point of view, and eager to have them come back in the future. I came across a funny Valentine’s Day themed article that pointed out how preposterous it would be to propose marriage on a first date. Though it’s more of a smart practice than a rule, for most businesses, it’s a big turnoff to ask first time visitors to break out their wallets. Cool your jets and do some nurturing first. If your site is rich with resources, it’s risky to ask visitors to scour through the pages to find what they seek. Put a simple search field on your home page and use content filters where they’ll help speed access to the content prospects might want. Understand the segments and personas you serve and place obvious signposts where they will help direct traffic. What’s more, allow visitors to qualify themselves so specific segments of your potential customer base can be addressed more personally and as pragmatically as possible. Ten points ago, I pointed out the ironic “conversion aversion” that stands between you and success. An equally potent form of self-sabotage is all too prevalent: web pages, or worse, entire websites that fail to provide clear directions. Put yourself inside the mind of the busy, multitasking, and unknowing visitor who knows not where to go and what to do. Tell her. Don’t be coy, cute, or mysterious. Have a loud, proud call-to-action on every page pointing the way to the next step in the buying cycle. Make it easy to find and painstakingly clear why it’s beneficial to CLICK HERE NOW. Unless you created a static website five or more years ago and haven’t given it any TLC since, it’s unlikely you’re guilty of all eleven violations we’ve covered. Do yourself a favor. Review the entire list and make sure your website has zero conversion repellents. I’ll leave you with a cheat sheet. Got ‘em? Great. Get to work giving visitors every reason to get into your website. For an even more comprehensive guide, download “21 Pointers to Sharpen Your Website,” a free eBook.